Not so easy waiting a turn to be the family artist. Photo by Christine Tibbetts, Blended Family TravelingMom. Wanting to be a Grandma keeping up with technology, I showed up at family holiday gathering with a gift to myself and let the little kids borrow it: the Crayola iMarker. 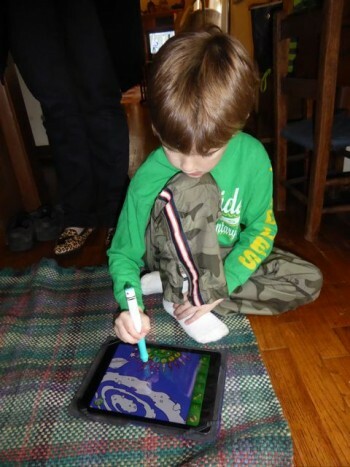 Felt trendy having my own iPad Air with the free Crayola Color360 app already downloaded, but smug didn’t last long since even little kids have their own small tablets or access to their parents’. In addition to showing off my “Grandmother’s cool” status, I was curious to see if this marker engaged the children after a first burst of activity and if it encouraged artistic interest. This is a winner for entertaining kids on road trips and keeping little ones distracted during airplane travel because only one easy-grip, oversized marker is needed for all the colors of a box of crayons. Griffin Technology makes the marker, retailing for $29.99 when I got mine in December, 2014. French is the preferred second language and that suited me fine reading package instructions with my 3-year-old granddaughter whose parents are both fluent in French. 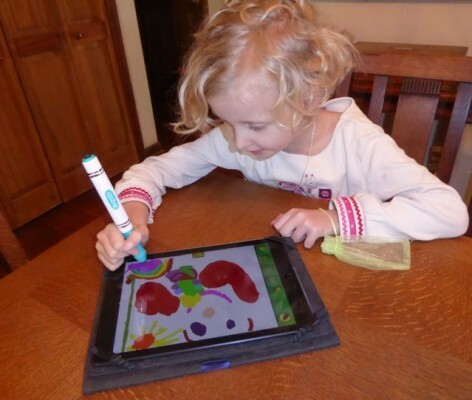 Crayola partnership is evident with the iconic logo on the device and the app. You provide the AAA battery and tiny Phillips-head screwdriver to open the battery pocket. Focus observed in free style drawing with the Crayola Color 360 app. Photo by Christine Tibbetts, Blended Family TravelingMom. I’d recommend Griffin enclose a screwdriver because not everybody has ready access to one. The iMarker must have a long battery life because many kids used it all month and I’m coloring now. First round involved three cousins, ages 3, 6 and 7, so that involved turn-taking and one-upmanship–just like it would have with old fashioned toys. It was a comfort to me during techie play that some things never change. Each child wanted more and more time. They were never bored with the options. Sometimes they clicked the icon to save their work, sometimes they erased. 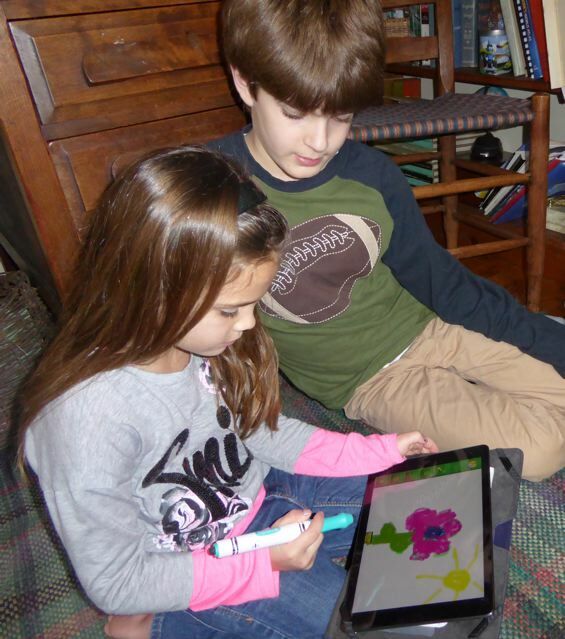 Second encounter was with a sister and brother, both great-grandchildren, a week later: the 6-year-old was immersed in blank screen creative drawing while the 3-year-old only wanted brief scribbling time. At the zoo, up in space, under the sea show up first. If techie Grandma or savvy kids know how to finger slide the screen, then more choices appear—amusement park, in the classroom, soccer field. Youngest iMarker artist contemplating her work.Photo by Christine Tibbetts, Blended Family TravelingMom. All those open up a full-and-scrolling plethora of scenes to color. Here’s the catch; staying inside the lines (and many are narrow) is controlled by the technology. Maybe that builds confidence; maybe it impedes skill development. The free draw screen was most popular with my third focus group: three nephews and a niece after Christmas. The 4-year-old engaged the music and sound effects features with great abandon. Most of my other young artists focused more on their colors, and they discovered the range of crayons, markers, pencils and paintbrushes easily. 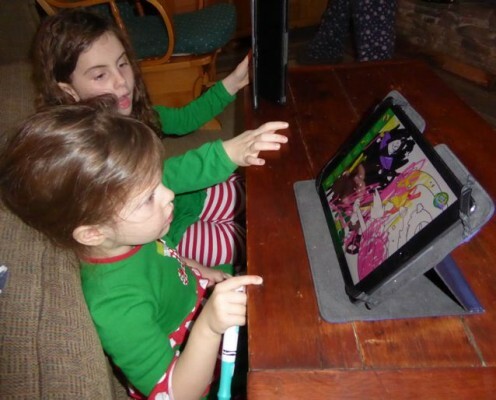 Here’s how this works: a traditional box of Crayola crayons appears on the bottom of the screen and kids know intuitively to tap it. Color wheel appears with creative tools to select. It’s a breeze even for me to tap a red paintbrush or sharp-tipped green pencil or orange crayon and purple marker and see how it looks on my paper. Yes, I know this is a technology screen but guess what? When you save your work, it is pinned with old-fashioned looking clothespins to hang in the gallery and then it looks like art on paper. 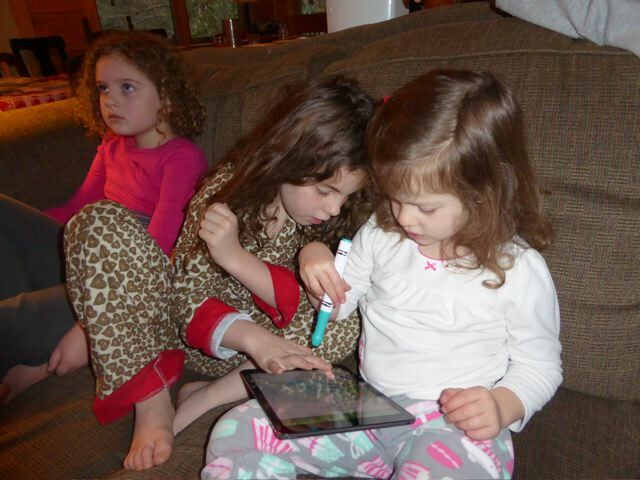 Cousins admiring drawing, and awaiting next turn. Photo by Christine Tibbetts, Blended Family TravelingMom. How cool is that for a device bridging multi-generational worlds? If I actually gave grandchildren gifts, instead of deposits in their college accounts, I’d buy one for everyone. What Would Professional Artists Think? Next I’m sharing the Crayola iMarker with adult artists skilled in watercolor, acrylics and oils to watch their reactions. Perhaps I’ll have to demonstrate the way it works before they paint!